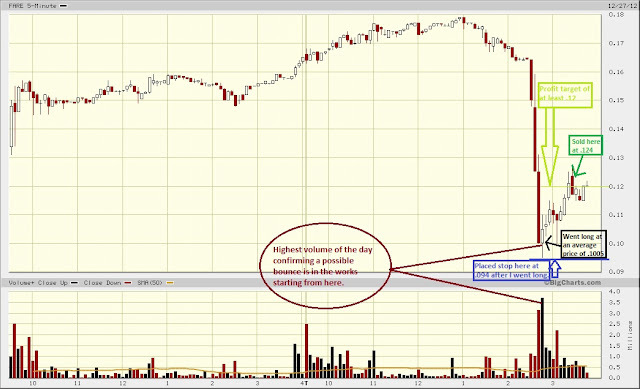 TRADER 9: Trade of the day, FARE!!! I thought it couldn't happen again today, but FARE is almost another perfect example of my bounce play strategies just how I explained (look at my previous blog post) it yesterday with SRGE. Caught the sell-off on this pump and dump, and the entry signal which ended up being a support level around .095 rather than a candlestick pattern. Went long 25,000 shares of FARE at an average price of .1005. I was looking for a profit target of at least .12, then it almost got there in about 10 minutes, but started tracking back down to my entry point I bought it at. Right when I was about to sell it and just break even, there was a huge buy order at .10. That seems to have gave it another legg, passing my profit target price of .12. Ended up selling it at .124 for a .0235 point gain. If you do the math, that's $587 in 30 minutes. The day wasn't really all that dandy because 80% of my profit on FARE was eaten up by losses on QCOR, HLF, and MRVL today. And one more thing, people that follow me on Stocktwits don't get to see my tweets on my position with FARE because Stocktwits don't like OTC/pink sheet stocks being tweeted on their site. If you have a twitter account you can follow my trades of OTC/pink sheet stocks.